Like my vegan cinnamon coconut cake at the AMT bake-off, I was not winning last week. I was working on a special video blog chronicling what happens behind the scenes of Inspire, BUT my iMovie crashed two days before the blog was due to be posted. I don’t know what to do! It makes me very sad and also very angry, but I am working on getting the problem resolved. 5. The gentlemen have it easy at the beginning of the show. By this, I mean that the gentlemen are not in the beginning of the show. So we have extra time to stretch, warm up, get dressed, and most importantly, watch YouTube videos. 4. Stairs are fun but they are also scary. I walk down the small set of steps into the audience during the song “Happy.” Stairs have always frightened me, but not to the point of having a phobia about them, as in, nobody would ever make a documentary about my discomfort with stairs. But c’mon, they’re scary, right?! And I was named after Rocky Balboa. Stairs shouldn’t scare me. 3. Sometimes our minds are reduced to a system of numbers. The stage serves as a theatrical number line of sorts, mapping out blocking and movement so that all of the elements of the production (performers, set, lighting, etc.) fit together like pieces of a puzzle. This makes learning blocking very organized and efficient, and soon our muscle memory supplements this numbered movement to create for consistency and accuracy during every performance. You think the song “I’m Alive” is hopeful and empowering … we think the song “I’m Alive” is 1-5-9-1-3-12. You know how we all gracefully enter and exit the stage with the poise of a thousand angels? As soon as we are out of the audience’s sight, we run. Run like Forrest Gump, sometimes. There are a lot of beautiful, jaw-dropping, red carpet ready looks in this show, and sometimes there is just so little time. Shout out to Char and Carol for helping us brave the madness! 1. Mingling with the crowd after the show is extremely rewarding for us. 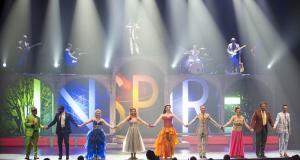 We perform this show a great many times. It is our responsibility to make the show feel fresh and new for every audience. This is crucial to their experience and enjoyment. So after the show, we head down to chat with them, and hearing their individual reactions and kind words makes every show feel fresh and new for us. It is a humbling, incredible feeling to know that we have made an impact on somebody’s day, week, or even year with our performance. I can’t say enough times how wonderful that feels. So there you have it! And next time I check in, my iMovie will hopefully be fully functional!